Use the Half Umbrella Collection to stay cool in smaller spaces. The Half Rectangular Umbrella (89"W x 54"D x 99"H) or the Half Round Umbrella (104"W x 55"D x 92-1/4"H) saves space without sacrificing shade and fits nicely on a balcony or small patio. The shape allows you to set either umbrella against a wall, conveniently cooling off small or awkwardly shaped areas. Both umbrellas easily crank open. Polyester outdoor material, aluminum pole and steel. 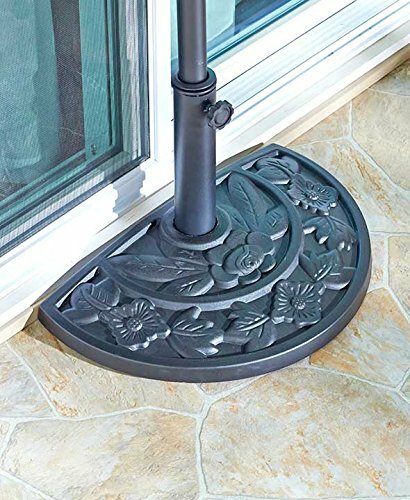 Place either umbrella into the cold cast ceramic and metal Half-Moon Base (19-3/8"W x 12-3/8"D x 12-3/8"H). If you have any questions about this product by MattsGlobal, contact us by completing and submitting the form below. If you are looking for a specif part number, please include it with your message.